The main focus in understanding Glacial cycles has been on the maximum summer insolation at 65N, yet prior to MPT (Mid Pleistocene Transition) all glaciations simply followed the obliquity cycle. To understand why obliquity is the underlying metronome, we need to consider the integrated summer insolation. Increases in the earth’s tilt boost insolation at both poles. The precession of the equinoxes only affects maximum summer insolation at one pole at a time because the earth has an elliptical orbit. Once every 23ooo years the Northern hemisphere summer coincides with perihelion and maximum insolation occurs at the summer equinox (June 21). Eccentricity of the earth’s orbit is the crucial factor in modulating just how strong this maximum value becomes, because eccentricity determines the distance at perihelion between the earth and the sun. If the earth’s orbit were circular then precession would have no effect at all. When eccentricity is low like it is today, then the effect is small , but 220,000 years ago a much larger eccentricity increased NH summer maximum insolation by 4 times greater than today. Despite this varying precession/eccentricity effect I would argue that the underlying influence on summer insolation is still obliquity, because it affects both poles equally. If obliquity were zero there would be no seasons on earth, while larger obliquity increases the size of climate zones. Figure1. A) Calculations of insolation at both poles, their average, and the integrated insolation over a full year. B) Ice Volume data(LRO4) compared to a parameterisation of obliquity and eccentricity. Click to expand. The solid red curve in Figure 1a is the integral of annual insolation received at the North Pole (~5GJ/m2). The precession signal now vanishes! Total summer insolation simply follows obliquity at both poles. The reason for this is because angular momentum is conserved during an elliptical orbit. This means that the earth speeds up near perihelion and slows down at aphelion. Perihelion summers may have a high insolation on June 21st but as a result these summers can be up to 20 days shorter than aphelion summers! Currently the SH summer is about 4 days shorter than the NH summer. The end result of this effect is that the total summer energy received from the sun in either hemisphere does not depend on precession at all. It depends only on obliquity. The dashed red curve in Figure 1a is the average insolation over both poles. Raymo et al (1) have proposed that prior to the MPT, the Earth was warm enough that cycles in ice volume for the Northern and the Southern hemisphere were out of phase and acted independently, depending only on local solar input. So the global effect on ice volume was the average of the two hemispheres and this caused ice volume to follows obliquity (Figure 2). This was possible before MPT because the East Antarctic Ice sheet melted back to land each cycle and so contributing to global ice volume. As the earth cooled beyond MPT so Antarctic Ice permanently saturated the continent shelf, breaking the N-S symmetry and Ice ages then became dominated by NH insolation alone. Another possibility proposed by Huybers (2) is simply that total summer insolation has always driven glacial cycles before MTP and even today is the dominant term. Figure 1a shows that eccentricity modulates the NH summer maximum. 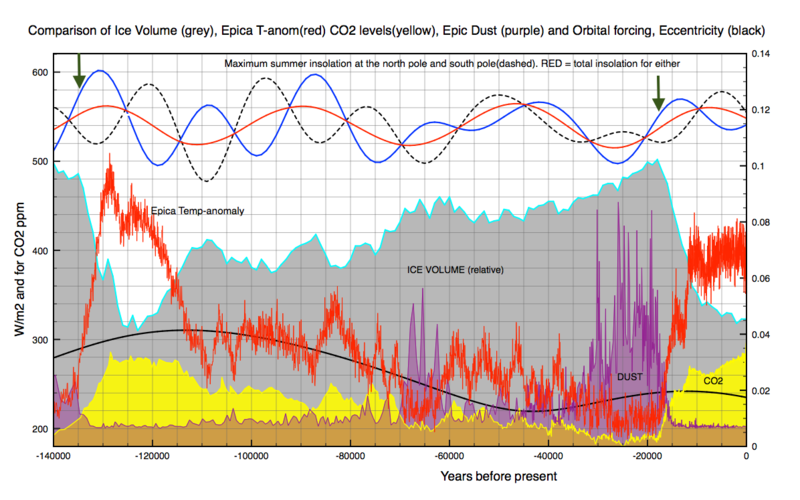 Figure 1b shows the Ice Volume data LRO4 from 600,000 years ago. Can eccentricity and obliquity alone describe post MTP ice ages, or is 65N insolation now the driver? The blue curve in figure 1B is simply a combination of eccentricity and obliquity, both inverted to match ice volume. The curve is not based on any physics, but is simply chosen ad hoc. Here it is. Surprisingly the main features of the last 6 glacial cycles in Figure 1b are reasonably well reproduced by this simple formula. This demonstrates how eccentricity still plays the hidden role after MPT by modulating the NH summer maximum insolation. Yet mysteriously only some NH summer maxima significantly reduce ice volume. However, none of this yet explains why the deepest glaciations, which always occur at low eccentricity, suddenly end with a bang, even though NH summer maximum insolation maxima remain small. The LGM is a classic example. Figure 3. Last Glacial Cycle. Note how larger NH insolation peaks before LGM had little effect on Ice Volume, although both Antarctic temperatures and CO2 both recovered slightly. The correlation of low CO2 with dust deposits in the ice however is striking. The largest deposits are just before rising temperatures ended the last glacial cycle. The next glaciation also looks to be even more severe than the last one as eccentricity falls to an all time low, last seen 2.8 million years ago! You can also see the 400 ky eccentricity cycle as well below in Figure 4. Figure 4. LA2010 calculations of the earth’s eccentricity over a 4 million year period spanning the present day. So what causes the deepest glaciations like the LGM to terminate? I think the most promising proposal so far is that increased Dust due to CO2 starvation reduces albedo and primes the ice sheets for rapid melting at the next NH summer maximum. This idea was originally proposed by Ralf Ellis(3). As low eccentricity glaciations deepen, so sea levels drop and CO2 levels fall below 200ppm. This CO2 starvation, combined with arid conditions causes boreal forests and vegetation to die back inducing dust storms that cover the ice sheets with dust over thousands of years. This occurs especially near their southern edges. During the LGM CO2 levels reached dangerously low levels of ~180 ppm causing arid desertification as temperate trees and savannah died off. The resulting dust storms then deposited huge amounts of dust onto the ice sheets increasing its albedo. The consequent NH summer insolation maximum, coinciding with maximum eccentricity, finally melted back the ice sheets through reduced albedo, aided by increasing CO2 and H2O feedbacks. When all else fails GAIA ends ice ages ! The fixation with Milankovitch forcing is one of the Fatal Follies of Contemporary Climatology. It reflects another Fatal Folly: the idiotic idea that the climate is a passive linear system that changes only in response to radiative forcing. It is of course true that the climate responds to external forcing, but that is not the only significant cause of major changes. The climate system involves multiple, intricately connected, nonlinear atmospheric, oceanic and terrestrial sub-systems, so the overall behavior can be extremely complex. It can and does exhibit abrupt changes, multiple equilibria, and limit cycles – i.e., autonomous oscillations, without external input — at every time scale from minutes to many millennia. There are many examples, such as the El Niño Southern Oscillation, the North Atlantic Oscillation, the bipolar seesaw, etc. 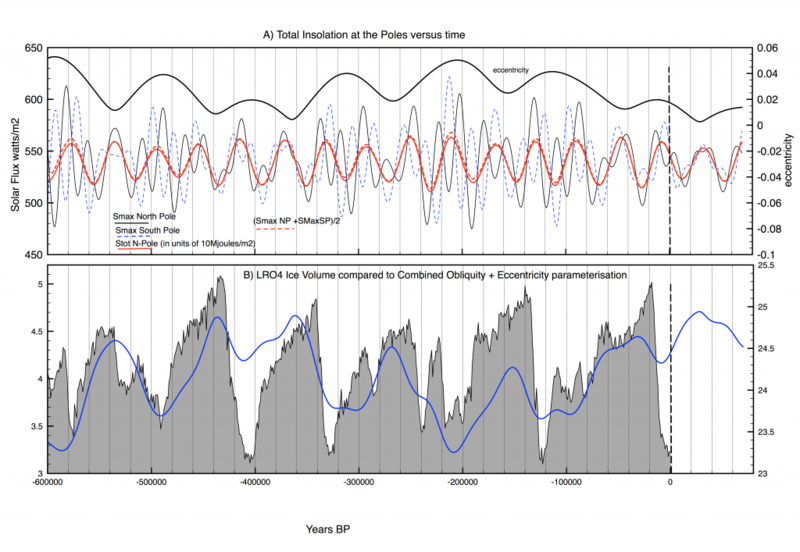 As long ago as 1984, Saltzman & Sutera proposed that the alternation of glacial and interglacial stages is the result of a relaxation oscillation synchronized by the astronomical cycles. In 2008 Nicolas Thouveny and pals pointed out that a geomagnetic excursion seems to coincide with the termination of every interglacial — but, being sorely afflicted with Milankovitis, they supposed that this must be due to the orbital cycles somehow causing the excursion. Since the Svensmark effect (galactic cosmic rays nucleating low clouds) now provides a plausible link between geomagntic excursions and cooling, it is much more probable that the triggers synchronizing the glacial/interglacial cycle.are some combination of Milankovitch effects, fluctuations in the geomagnetic field and perhaps others. If this is correct, it is important, because the geomagnetic field has been collapsing for 20 years: does this mean that the Holocene is ending? We don’t really know why the geodynamo exhibits these fluctuations, but it may be significant that the MPT (and the change in the length of glacial stages) coincided (within the dating accuracy) with the last full reversal of the geomagnetic field. Theoretical calculations and experimental studies of liquid behavior in rotating spheroidal containers suggest that precession of the polar axis provides most of the energy required to maintain the geodynamo (with some contribution from convection). Precession also induces vortices and turbulence, including chaotic instabilities. Perhaps the glacial stages average 100,000 years when the principal current flow is in the same direction as the rotation due to precession (as it is now), and 41,000 years when it is in the opposite direction. Clive, analyzing your charts it seems that Ellis’s theory of albedo dust impairment, priming the NH glaciers for sensitivity to the next proximate NH insolation peak, makes perfect sense and is consistently corroborated by the record you illustrate. The charts also seem to reveal that interglacials are inherently sensitive to every subsequent trough in NH insolation regardless of 300+ppm CO2. In the earth’s current geologic state it is very clear that NH glacial ice modulated albedo has been the primary driver of the ice age. Although we know that CO2 forcing is a factor it does not seem to play any role in paleoclimate except perhaps as an inertia to changes of glacial state. I notice it appears on the chart that we are currently mid-way in a ~5000-yr upswing in insolation. 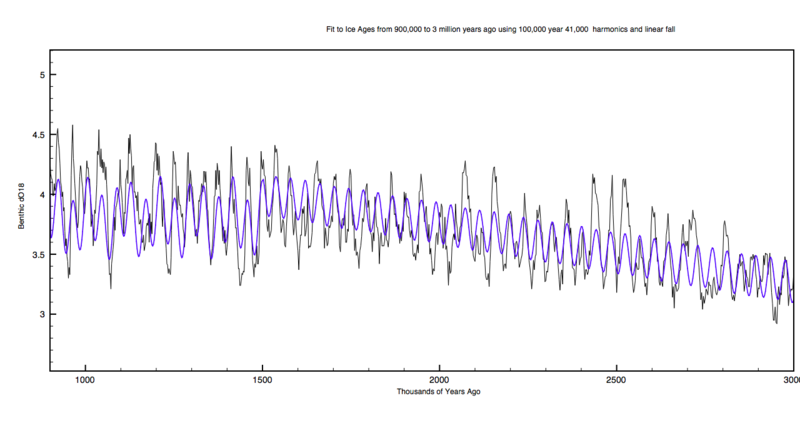 Yet, global temperatures have been declining for the last 5000-8000 years since the Holocene optimum, even while CO2 is rising and glaciers are melting, as evidence by sea level rise. How is the Holocene temperature trend accounted for under the influence of insolation, albedo and CO2? I think dust albedo becomes the crucial factor to end glaciations at low eccentricity. If eccentricity is high then this boosts summer 65N insolation sufficiently to melt back the ice sheets, for example the 2 mini-interglacials 600,000 years ago. CO2 forcing plays no direct role in glacial cycles. You can see this in the top graph where CO2 remains high well into the beginning of the last glacial period following the EPICA interglacial. CO2’s role is simply a feedback both in cooling and warming. Yes there is a short increase in NH insolation following the holocene peak. However obliquity is still decreasing and this always means a new glacial period is beginning. The next ice age will be well underway in 15000 years time. The answer to your last question is nobody really knows ! Thanks Clive. To reanalyze my own question, it makes sense that that global temperature for the Holocene would be declining even though NH insolation is currently increasing when one takes into account that SH insolation is drastically decreasing. Though the NH insolation is key for the throwing of the icehouse switch, once that happens then both poles offset and obliquity becomes the temperature control knob. I agree, that with obliquity sharply diminishing for the next 10,000 years, it would be impossible for Earth not to re-enter NH glaciated state — if not saved by humanity. Incredibly, I saw one professor on YouTube actually choke up with shame that we would impede on Gaia’s divine destiny. Our industrial fossil fuel CO2 will only protect us for a few hundred years since the oceans are sinking it. The Ellis theory underscores is the importance of albedo. As for the next hundred years, considering the charts above, CO2 extraction seems foolish as compared with a more powerful and actuating albedo control knob via geoengineering. Seeing history, and the otherwise inevitable geologic future, it’s clearly important to have a knob that can be turned in either direction. Does anyone have any favorite geoengineering concepts? Find better ways for agriculture which needs less space. More trees. Stop groundwater depletion, start using ocean water and store the salt. Stop dumping of raw human waste in coastal waters. Warmer is not bad Colder is bad. One idea to accomplish all solutions is to build in the tropical seas. Start with neutral buoyant anchored platforms expanding from the coastline of existing islands like Puerto Rico, for example. The platforms would serve as solar reflectors, collectors and break-waters. They could be sold as hurricane mediators that could be outfitted to with water pumps to exchange the warm surface water with cool water from the deep to starve the hurricane of energy just before making landfall on the island. They might also act as breakwaters to storm surge, all while capturing tidal or storm energy through their tethers tension relieved through flywheel dynamos. They could house giant solar and wind farms that are not in anyone’s backyard. Their solar yield could be boosted by orbiting geo-synchronous solar reflectors giving 24-hr localized daylight. Clive, if a hurricane is caused by the gradient of warmer water and cooler air perhaps the orbiting solar reflectors could be directed to tops of tropical storms to disrupt the gradient by warming the tops. Does this seem like sound physics? If anyone is thinking of who would pay to start such a project, think about the military applications of submersible airstrips, even if just for emergency landings. I’m sure the new US Space Force could be thinking about orbiting solar reflectors and such (like how to focus them on targets). These schemes might work if there is money to be made out of them by private companies. If on the other hand they were government or UN funded then they would consume vast amounts of money, some of which is creamed off by fraud, and of course it would never work! I like your charts. I notice there is a 40,000 year lag between eccentricity and change in temperature. That just happens to be the obliquity cycle period. With particular reference to figures 3 and 5. Eccentricity is mean eccentricity. Do you have eccentricity charts that include instant evventricity?